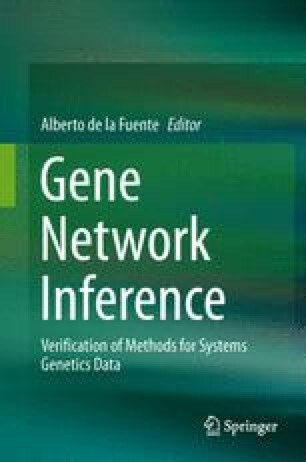 In this chapter, we study different gene regulatory network learning methods based on penalized linear regressions (the Lasso regression and the Dantzig Selector), Bayesian networks, and random forests. We also replicated the learning scheme using bootstrapped sub-samples of the observations. The biological motivation relies on a tough nut to crack in Systems Biology: understanding the intertwined action of genome elements and gene activity to model gene regulatory features of an organism. We introduce the used methodologies, and then assess the methods on simulated “Systems Genetics” (or genetical genomics) datasets. Our results show that methods have very different performances depending on tested simulation settings: total number of genes in the considered network, sample size, gene expression heritability, and chromosome length. We observe that the proposed approaches are able to capture important interaction patterns, but parameter tuning or ad hoc pre- and post-processing may also have an important effect on the overall learning quality. We are very grateful to the staff of the GenoToul (Toulouse, France) Bioinformatics plateform for the computational support it provided during this work. We would also like to thank our colleagues from CRS4 Bioinformatica for creating the datasets of the present study.